Clancey,W.J. (1991) "The biology of consciousness: Comparative review of Israel Rosenfield, The Strange, Familiar, and Forgotten: An anatomy of Consciousness and Gerald M. Edelman, Bright Air, Brilliant Fire: On the Matter of the Mind." Artificial Intelligence 60: 313-356. William J. Clancey Institute for Research on Learning 2550 Hanover Street Palo Alto, CA 94304 Institute for Research on Learning, 2550 Hanover Street, Palo Alto, CA 94304 Artificial Intelligence 60: 313-356, 1993 This is the technical report version, please refer to printed copy when quoting for publication * (Alfred A. Knopf, New York,1992); xi + 157 pages. For many years, most AI researchers and cognitive scientists have reserved the topic of consciousness for after dinner conversation. Like "intuition," the idea of consciousness appeared to be too vague or general to be a good starting place for understanding cognition. Work on narrowly-defined problems in specialized domains such as medicine and manufacturing focused our concerns on the nature of representation, memory, strategies for problem-solving, and learning. Some writers, notably Ornstein(1972) and Hofstadter (1979), continued to explore the ideas, but implications for cognitive modeling were unclear, suggesting neither experiments, nor new computational mechanisms. But the time has arrived for raising consciousness in cognitive science. Books by Edelman, Rosenfield, Dennett, Varela, and others have appeared almost simultaneously, with a strikingly common theme: Biological and psychological evidence suggests that better understanding of consciousness is not only possible, but necessary if we are to improve our understanding of cognition. This evidence varies considerably, ranging from how neurological structures develop, the effects of neural dysfunctions on human behavior, perceptual illusions, the evolution of the human species, and the philosophy of language. In this comparative review, I consider the work of Edelman and Rosenfield. Taken together, these books may stimulate a broader view of intelligence, give further credence to the situated cognition view of language, and provide a more biological basis for "neural net" approaches. Prior work by Putnam, Dreyfus, and Winograd, to name a few previous critics, may also appear less threatening or less nonsensical when argued in neurophysiological terms. Rosenfield's psychological analysis of human experience motivates Edelman's more detailed neurological models of the brain, so I will consider The Strange, Familiar and Forgotten first. This book is a significant contribution to cognitive science literature, in the interpretive, historical style of Sacks (1984) and Luria (1968). Like Sacks and Luria, Rosenfield is an MD with a historian's bent. With a PhD in "intellectual history," Rosenfield attempts to make sense of clinical neuropsychology research (which he often translates from French sources). Reinterpreting past work, he applies a developmental perspective that learning occurs with every human interaction. Like Sacks and Luria, Rosenfield uses historically well-documented cases to illustrate and contrast theories of memory, learning, and consciousness. Like them, he provides an ethnographic perspective on the patient, not merely as a patient with a lesion but as a person struggling to make sense of emotional, physical, and social experience. He considers not only laboratory evidence of the patients'verbal and perceptual behavior, but the stories they tell about their social life and mental experience. Asked where his own ring was, he said, "It's been taken away from me." And why was he now wearing a bracelet? "It has been put on me." "But this hand is all white and not as hairy as your own." Rosenfield argues that we need to better understand the nature of consciousness as a process, an activity in its own right, not as a side-effect, but an ongoing accomplishment. Related work by Greenwald (1981) argues for the need to "explain one particularly intriguing 'emergent'property of the self system--its tendency (in the normal case) to perceive itself as unitary and real." We need a global view of the dynamics of sense-making, of creating an integrating view--in our conscious behavior--of our self-image. This parallels the emphasis in situated cognition (e.g., Suchman's (1987) study of the use of plans) on representing as occurring in sequences of interactive behavior over time, within some ongoing situation, as opposed to being disembodied manipulation of calculi, in some timeless hidden (and subconscious) place inside the brain. Rosenfield and Edelman help us understand why all reasoning isn't subconscious: Sense-making (telling causally-connected stories) involves relating what you are currently doing to what you have experienced in the past and what you expect will occur in the future. Significantly, "relating" occurs without necessarily representing such relations in words, but rather directly, via neural feedback loops that couple perception, past (non-linguistic) conceptualizations, and bodily movements. What is a patient doing when he says that last Saturday he was in the city of La Rochelle, when he has no idea what day was yesterday and denies that he is still in La Rochelle today? Rosenfield closely examines such story-telling behaviors, revealing that patients are not merely retrieving facts from memory, but revealing how they make sense of experience. By examining what can go wrong--in maintaining a sense of continuous time, an integrated personality and body image, and abstract categorical relations--we can understand better how consciousness structures everyday experience. Thus, we cannot factor a complex social situation into so much biology on one side, and so much culture on the other. We must seek to understand the emergent and irreducible properties arising from an inextricable interpenetration of genes and environments. In short, we must use what so many great thinkers call, but American fashion dismisses as political rhetoric from the other side, a dialectical approach. According to this dialectical perspective, neural processes activate and are generalized within larger neural and social coordinations which they constitute, yet which create them. Areas of the brain are specialized, but the degree of modularity and stability is different from the labeled memory structures and independently invokable subroutines of most cognitive models. 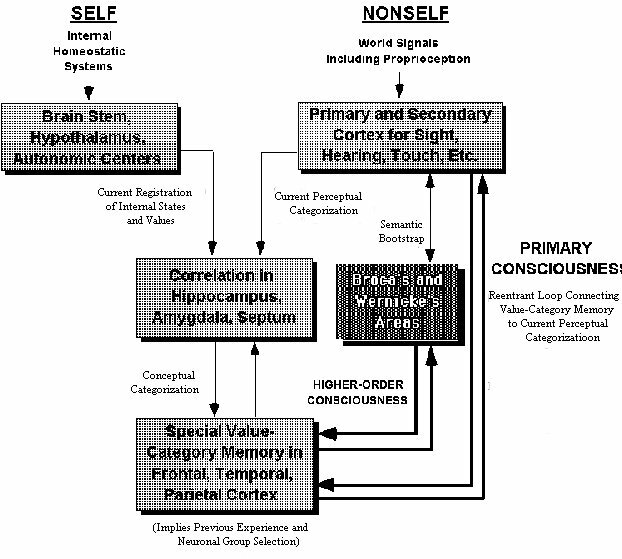 Areas of the brain aren't merely accessed or activated, but organize each other within complete circuits (as emphasized in Dewey's (1896) criticism of stimulus-response theories). According to Edelman's model of the brain, these circuits are themselves generalizations involving bi-directional recategorizations at perceptual, sequential, conceptual, and linguistic levels. Like Edelman, Rosenfield emphasizes the "interpenetrating" multiple levels of individual development, species evolution, and the interaction of cultural and neural processes. But in the more narrow style of cognitive neuropsychology, he focuses on what abnormal behavior reveals about normal function. In order to explain dysfunctions, as well as the openness and subjectivity of categories in everyday life, Rosenfield argues for a brain that continuously and dynamically reorganizes how it responds to stimuli (p. 134). Rather than retrieving and matching discrete structures or procedures, the brain composes itself in-line, in the very process of coordinating sensation and motion (hence behavior is "situated"). By Dewey's analysis, perceptual and motor processes in the brain are configuring each other without intervening subconscious "deliberation" (Clancey, in press). The kinds of confusion reveal the normal function of the brain in coordinating present awareness with previous experience. Being conscious is being engaged in the act of sense-making; brain-damaged patients exhibit "a breakdown in the mechanisms of consciousness. A patient's state of confusion is no more to be ignored than his failure to recognize, say, his home. Memory, recognition, and consciousness are all part of the same process." (p. 35) Self-reference is integral to sense-making, and it is grounded in bodily experience. In people, there can be no "normal" understanding of language, no sense of time, no personality without a sustained, coherent self-image. The cases of brain-damaged patients support this view, but ultimately Edelman's architectural arguments provide the needed implementation-level support. Rosenfield's model, in which memory is integral to skills, resembles theories such as Schank's dynamic memory (MOPS) and case-based reasoning, in which experiences and generalizations are integrated. However, these models postulate that declarative facts are stored as discrete units, even if they are linked to how they have been "accessed" or "used" in the past. Rosenfield and Edelman consistently emphasize that the brain operates only procedurally, with no storage of semantic information, either declarative or programmatic, as discrete linguistic structures (Clancey, 1991). Unlike Edelman, Rosenfield makes no attempt to address the AI audience directly. His statements require some reformulation to bring home the insights. For example, Rosenfield says, "No machine is troubled by, or even intrigued by, feelings of certainty that appear contradictory." (p. 12) Yet, AI researchers cite examples of how a program detects contradictory conclusions and uses that information. Without further discussion, it is unclear how being troubled is an essential part of creating new goals and values. Providing a convincing case requires understanding the reader's point of view well enough to anticipate rebuttals. To this end, I re-present Rosenfield's key cases and contrast his analysis with other cognitive science explanations. The central themes of his analysis are: non-localization of function, the nature and role of self-reference (subjectivity), the origin and sense of time in remembering, the relational nature of linguistic categories, and the problem of multiple personalities. I reorder these topics in order to more clearly convey the neural-architectural implications. The process of sustaining a self-image is illustrated by people with multiple personalities. Rosenfield argues such experiences are caused by pathology that limits neural organizational processes. Again, neural structures coordinating what we say, imagine, feel, and how we move are activated "in place," as we are in the process of speaking, feeling, moving. Saying that some memories are forgotten and others recalled suggests a process of search and matching for relevancy; instead, the brain directly reorganizes itself on a global basis, not merely filtering or "reinterpreting" sensations, but physically recoordinating how perception and conceptualization occur. We sometimes experience such figure-ground switches in our own experience: "Yesterday's 'friend'is today's 'objectionable person.'" In normal people recategorization is gradual. In the patient with multiple personalities, "None of his or her personalities fully 'fits'the dynamic experience of everyday life: one personality will recognize family and friends; another will treat them as strangers and enemies." (p. 123) There are "too few 'selves'" (p. 138), a confined repertoire of fixations. Each personality appears one-dimensional; the reorganizations are disjoint. There is no gradation of "somewhat remembering" or "somewhat being able to control" the other personalities. This clinical evidence supports the neurobiological model of modular co-determination provided by Edelman, which we will discuss later. Rosenfield's analysis of Mr. March's left-side discoordination supports Lakoff's (1987) view that understanding of the world is grounded in and emerges from the dynamics of body movements. Body movements serve as a frame of reference by which stimuli are organized, and upon which more complex coordinations and categorizations are built. For the infant, consciousness only develops after "genetically determined reflexes" (p. 61) provide initial experience upon which stimuli can be systematically experienced and organized. The relation between new and old (what Edelman calls "the remembered present") is experienced as a sense of self-familiarity during activity itself, forming the basis of self-awareness and ultimately personality. The nature of self-reference is revealed by patients with loss of awareness of their limbs ("alien limbs"), as well as the changed experience of people who become blind. For example, Hull suggests that after becoming blind he has difficulty in recollecting prior experiences that involve seeing. Rosenfield's interpretation is that neurological structures involved in seeing are now difficult to coordinate with Hull's present experience. His memories are not lost, but his visual self-reference is limited. That is, remembering is a kind of coordination process. Hull's present self-image is visually restricted: "There is no extension of awareness into space�I am dissolving. I am no longer concentrated in a particular location�" (quoted by Rosenfield, p. 64) Without an ongoing visual frame of reference, he is unable to establish relations to his prior visual experience. Again, recollecting isn't retrieving and reciting the contents of memory, but a dynamic process of establishing "relations to one's present self." (p. 66) "Establishing relations" means physically integrating previous neural activations with currently active neural processes. A stored linguistic schema model fits Hull's experience less well than a model of memory based on physical processes of bodily coordination. The case of Oliver Sacks's (1984) alien leg (paralyzed and without feeling because of an accident) also reveals self-referential aspects of awareness. Upon seeing his leg in his bed and not recognizing it, Sacks actually tossed it out of the bed, landing on the floor. Rosenfield emphasizes that "seeing is not by itself 'knowing'and that the lack of inner self-reference, together with the incontrovertible sight of the leg, therefore created a paradoxical relation to it" (p. 53). Sacks is not just sensing his leg, for he can clearly see it and recognizes that it is a leg. Instead, Sacks is relating his categorizations to his ongoing sense of himself and his surroundings. If we see a strange object in our bed (especially an unfamiliar leg), we move to throw it out. Rosenfield argues that we cannot separate categorizing from this ongoing process of sustaining the self vs. non-self relation. Both Rosenfield and Edelman argue that most cognitive models and AI programs lack self-reference, or view it as a secondary reflection after behavior occurs. Edelman's models suggest that self-reference involves neurological feedback between levels of categorization, including feedforward relations between higher-level coordinating and lower-level perceptual categorizations. Another patient studied by Charcot, Monsieur A, lost his ability to recognize shapes and colors. He could no longer draw or visualize images (both of which he previously did extraordinarily well) or even recognize his family. As often occurs in these cases, Monsieur A was now, in his words, "less susceptible to sorrow or psychological pain." This diminished sense of pleasure and pain indicates a change in self-reference, of awareness of the self. Oddly, Monsieur A could speak and answer questions and continued his work and everyday life in a somewhat disjointed way. But he was unable to establish a relation between words and his sensory experience. He understood words only in their abstract relations. As in Hull's case, this inability to perceive now impaired his ability to remember; as Monsieur A put it, "Today I can remember things only if I say them to myself, while in the past I had only to photograph them with my sight." (p. 93) This suggests again that remembering is integrated with sensory experience, that remembering is a form of perceiving. Early work by the "diagram makers" viewed neural lesions in terms of cutting off areas of the brain, such that stored images, word definitions, or the like are inaccessible. Contradicting Charcot, Rosenfield claims that Monsieur A had not lost specific visual memories, but his ability to integrate present visual experience--to establish a present sense of himself--that included immediate and practical relation with colors and shapes. Semantic content doesn't reside in a store of linguistic categorizations, but in the relation of categorizations to each other. Indeed, every categorization is a dynamic relation between neural processes. Edelman's model suggests that in Monsieur A neural maps that ordinarily relate different subsystems in the brain are unable to actively coordinate his visual sensory stimuli with ongoing conceptualization of experience. Experiments show that sensory categorization may still be occurring (e.g., some patients unable to recognize friends and family may exhibit galvanic skin responses) (p. 123). But conscious awareness of sensation requires establishing a relation with the current conceptualization of the self. The process of sustaining self-coherence has a holistic aspect, such that loss of any one sensory modality has global effects on memory and personality. Again, this argues for consciousness not as a side-effect of a discrete assembly of components, but as the business of the brain as it coordinates past activation relations with ongoing perception and movement. A sense of time is inherently relational. Time is another manifestation of self-reference, awareness that present experience bears a relation to what we experienced before. Rosenfield argues that such feedback is inherently part of ongoing conscious awareness. When it is impaired, not only is memory impaired, but also our ability to learn, to coordinate complex concepts, and to sustain a coherent personality. Again, dysfunction reveals processes that we take for granted in everyday experience and inadequately credit in our theories of cognition. Mabille and Pitres'patient in 1913, Mr. Baud, provides a good example. When asked if he knows the town of La Rochelle, he replies that he went there some time ago to find a pretty woman. He remembers where he stayed, and says that he never went back. Yet he has been in a hospital in La Rochelle for thirteen years. He also says he has a mistress whom he sees every Saturday. Asked when he last saw her, he responds, "Last Saturday." But again he hasn't left the hospital in all this time (p. 80). Contradicting Mabille and Pitres, Rosenfield tells us that we have no idea what the patient meant by "last Saturday." It could not possibly be a specific Saturday since he has no idea what day today is; Mr. Baud has no specific memory beyond the past twenty seconds. Oddly, Mr. Baud is a bit like a stored linguistic schema program. He knows how to use words in a conversation, but he has no ongoing, connected experience. He is like a program that has only been living for twenty seconds, but has a stored repertoire of definitions and scripts. He knows the patterns of what he typically does and answers questions logically on this basis: Since he goes every Saturday, he must have gone last Saturday. But from the observer's perspective, which transcends Mr. Baud's twenty-second life span, he lacks a sense of time. Interpreting his case is tricky, because Mr. Baud can't be recalling La Rochelle as we know it if he doesn't acknowledge that he's currently in that town. How in fact, could he be recalling any place at all or any time at all in the sense that we make sense of our location and temporal experience? Rosenfield argues that our normal "relation to the world is not sometimes abstract and sometimes immediate, but rather always both." (p. 80) To say that Mr. Baud has abstract, long-term memory, but lacks immediate, short-term memory ignores how our attention shifts in normal experience as we relate recollections to what we are experiencing now. "Distant experiences become specific--refer to a specific event in our past--when we can relate them to our present world." (pp. 75-76) Without this ability to coordinate his reminiscences with his present experience, Mr. Baud exhibits a breakdown in an aspect of sense-making, not merely a loss of memory or inability to store recent experiences. His recollections are "odd abstractions, devoid of temporal meaning."(p. 77) That is, a sense of time involves a kind of self-reference that Mr. Baud cannot experience. Strikingly, this view of meaning goes beyond the idea of "indexicality," previously emphasized in situated cognition (e.g., Agre, 1988). Understanding is not just establishing the relation of words like "last Saturday" to the present situation. Knowing the present situation involves having a dynamic sense of self. Without being able to relate my experiences (either past or present) back to me (p. 87), my awareness of the past, of history, of memory, and the present situation will be impaired. Put another way, understanding, as well as remembering and reasoning, involve orienting my self. If I am confused about who I am, I can't understand what "here" and "now" mean. Consciousness as a mechanism sustains a relation between our recollections and our ongoing sense of self. Naming, history-telling, and theorizing--integral aspects of sense-making (Schön, 1990)--are ways of establishing relationships in our experience (p. 98). Mr. Baud, lacking an "immediate" relation to his surroundings, can't have an abstract relation either. His recollections are timeless in lacking a relation to the present (p. 80). The view that there are isolated functions, such as short and long-term memory, and that one is simply missing, is inadequate. It is Mr. Baud's ability to coordinate neural processes, not access stored facts, that is impaired. This illustrates the thematic contention of Rosenfield and Edelman that cognitive science benefits from a biological re-examination of the nature of memory. In effect, prevalent functional models and computational engines assume a separability of activation and processing that the brain does not employ. Rosenfield cites studies that suggest that dysfunctions like Mr. Baud's appear to be caused by damage to the hippocampus and associated structures in the limbic system (p. 85), which is "essential for establishing the correlations between the body image and external stimuli that are the basis of consciousness." (p. 86) Edelman's analysis goes further to relate such "primary consciousness" to conceptual categorization by the cortex. Rosenfield's discussion of language provides a good introduction to Edelman's model. Both authors claim that the nature of the brain's development, coupled with the evolution of language, suggest that grammars are neither innate nor stored as discrete structures in the brain. Speaking a language involves continual recategorization of both the sounds and meanings of words. A stored-rule view of static information is not sufficient to explain how we dynamically understand "different speakers [who] pronounce words differently, and a given speaker may pronounce the same word in a number of different ways." (p. 37) Rosenfield and Edelman argue that we are restructuring previous neural activations directly, not reasoning about features of sounds or using an intermediate, descriptive representation. Crucially, the same in-place adjustments occur as we conceptualize and understand meanings. As an example, Rosenfield describes brain-damaged patients unable to use terms like "red" abstractly, but who can nevertheless perceive and sort objects by color. Again, Rosenfield argues against a "disconnection model" in which concepts like "red" are assumed to be innate categories. This model is still current in cognitive neuropsychology, with claims that different kinds of words such as proper nouns, verbs, prepositions, etc. are stored in different parts of the brain that are genetically functionally specialized. An alternative explanation is that the mechanism by which relations are constructed and differences generalized is impaired: The patient "finds puzzling Gelb and Goldstein's insistence that all the variant shades are 'red.'" (p. 103) The patient has difficulty forming kinds of conceptual categorizations (i.e., coordinating perceptual categorizations), not retrieving facts about colors. It is with remembering as it is with the stroke in a skilled game. We may fancy that we are repeating a series of movements learned a long time before from a text-book or from a teacher. But motion study shows that in fact we build up the stroke afresh on a basis of the immediately preceding balance of postures and the momentary needs of the game. Every time we make it, it has its own characteristics. Instead of a score, the brain's "players" are reenacting their previous roles, improvising their relations to each other in a new composition. Chaos or "oscillation" models of the brain (Freeman, 1991) suggest that both local interactions and global effects may be accommodated simultaneously, in real time. Edelman's "maps of maps" provide another top-down organizing mechanism. The key ideas involved in dialectical control and organization are: (1) composition in place (as opposed to use of buffers, copying, or a central place where conceptions are assembled; in terms of the analogy, the musical effect arises and exists only in actual playing), and (2) no intermediate linguistic descriptions in the forms of grammars, scripts, or word definitions (except in so far as the person interactively engages in such representing behavior in cycles of perceiving and acting over time; taking our analogy literally, musical scores are only interpreted in playing over time, not stored and executed internally). Finally, for the ensemble of musicians, as well as the brain, coherence arises because of the relation between local and global constraints. Possible relations are constrained by the available mechanisms in the brain, the evolution of human language as a social process, and the development of the individual. Rosenfield illustrates the generalization process of creating new languages with examples of sign language and Creole. Note that the issue is how a new language develops, not how people learn an existing language. In this case, linguists observe a two-generation process by which the first generation of children and adults develops gestures or pidgin, with only a simple grammar if any at all. The younger children of the second generation "abstract (categorize) the gestures of older students, creating from them symbols and more abstract categories of relations among these symbols--a true grammar. An older child may point (gesture) to a rabbit to indicate his subject; a younger one will categorize the pointing gesture as 'rabbit,'and the gesture becomes a symbol." (p. 110-111) The need for a second generation suggests that neural mechanisms alone are not sufficient, in the individual, for developing a new grammatical language. Rosenfield and Edelman both argue against the existence of specific innate categories or grammar rules, and emphasize the overwhelming importance of cultural influences on what can be accomplished by individuals. However, they agree that the mechanism that enables grammatical language to develop involves neurological structures that evolved in the human species and are not found in other animals. Nevertheless, these are "new areas of the brain�not new principles of mental function." (p. 119) This is supported by Edelman's model, which shows new relations between existing processes of categorization, not a new kind of compositional activation process. Similar arguments are made by Head and Bartlett; more recently, Calvin (1990) claims that sequencing control processes for physical movements such as throwing are involved in speech and complex conceptualization. That is, the same kinds of neurological processes may occur in different areas of the brain, becoming specialized for different functions through use. Rosenfield calls this the "holistic" view, in which parts are "not independently specialized, but interdependent." (p. 24) Categorizing areas of the brain establish dynamic, time-sensitive relations to other areas, as opposed to storing discrete representations of words, sounds, meanings, etc. in isolation. This is also what Rosenfield means when he says that functions are not predetermined, either inborn in the infant or as pre-stored responses in the adult. The primary repertoire of neural interactions, within which categorization and coordination occurs, is not determined by genes, but develops in adolescence through a complex process involving topological constraints, redundant connections, and experiential strengthening. Even the brains of identical twins are wired differently (p. 82). This is of course strong evidence against the idea that specific linguistic rules or categories could be inherent in the brain. Rather the existence of commonalities in human language, known as universal grammar, is evidence of common transformational principles by which categories are formed. The brain, linking these gestures to its nonlinguistic categorizations of its own activities, and categorizing these linked signals in another special memory system, created the basis for a gestural system that can refer to objects and actions. A developed gestural language became a stimulus [internally] and was recategorized into symbols and a true syntax. After sufficient lexical experience, the language was in turn treated as a stimulus by the categorical centers and recategorized; thus language became an independent means of thought, creating the notion of time past, present, and future. (pp. 112-113; emphasis added). As we will now see, Edelman's models of the brain specify what areas of the brain are involved and their relations to each other. AI researchers may struggle to find implications for program design in Rosenfield's book, so I have explained his ideas at some length. Edelman's argument is more accessible to AI researchers because he draws on some familiar sources, referring to Lakoff throughout the book, and explicitly discussing models of representation and learning. Nevertheless, the neurobiological argument is intricate and is by and large unfamiliar to AI researchers. Although the theory of Neural Darwinism has been reviewed for this audience (Smoliar, 1989; 1991), I present the ideas again to provide an alternative synthesis that includes Edelman's earlier work on topobiology and makes connections to the broader themes of cognitive science that Edelman now wishes to emphasize. The title Bright Air, Brilliant Fire comes from Empedocles, "a physician, poet, and an early materialist philosopher of mind" (p. xvi) in the sixth century B.C., who suggested that perception can be understood in terms of material entities. Edelman believes that understanding the particular material properties of the actual "matter underlying our minds--neurons, their connections, and their patterns,"(p. 1) is essential for understanding consciousness and building intelligent machines, because the brain works unlike any machine we have ever built. Of special interest is how Edelman relates his understanding of sensorimotor coordination to Lakoff's analysis of concepts as embodied processes. The book is organized into four parts: 1) Problems with current models of the mind; 2) Origins of new approaches based on evolution and developmental biology; 3) Proposals for neurobiological models of memory, consciousness, and language; and 4) Harmonies or "fruitful interactions that a science of mind must have with philosophy, medicine, and physics." (p. 153) The book concludes with a forty page postscript, "Mind without biology," criticizing objectivism, mechanical functionalism, and formal approaches to language. I will cover these ideas in the same order: 1) biological mechanisms that are potentially relevant, and perhaps crucial, to producing artificial intelligence; 2) a summary of the theory of Neural Darwinism; 3) how consciousness arises through these mechanisms; and 4) the synthesis of these ideas in the Darwin III robot. In Section 4, I elaborate on the idea of pre-linguistic coordination, which reveals the limitations of stored linguistic schema mechanisms. In Section 5, I argue for preserving functionalism as a modeling technique, while accepting Edelman's view that it be rejected as a theory of the mind. If you consider these extraordinary brain properties in conjunction with the dilemmas created by the machine or the computer view of the mind, it is fair to say that we have a scientific crisis�. For a possible way out, let us look to biology itself, rather than to physics, mathematics, or computer science. (p. 69). Edelman believes that neuroscience now allows us to begin "connecting up what we know about our minds to what we are beginning to know about our brains." (p. 5) His analysis combines an alternative epistemology, which he calls "anti-cognitivist," with biological mechanisms he calls "value-based selectionism" and "Neural Darwinism." This distinction between practice and theory dominates anthropological theory (Tyler, 1978). Although science cannot exhaustively describe particular, individual experiences, it can properly study the constraints on experience. Edelman focuses on biological constraints. He claims that the biological organization of matter in the brain produces kinds of physical processes that have not been replicated in computers. "By taking the position of a biologically-based epistemology, we are in some sense realists" (recognizing the inherent "density" of objects and events) "and also sophisticated materialists" (p. 161) (holding that thought, will, etc. are produced by physical systems, but emphasizing that not all mechanisms have the same capabilities). Edelman believes that cognitivism produced "a scientific deviation as great as that of the behaviorism it attempted to supplant" (p. 14) in assuming that neurobiological processes have no properties that computers don't already replicate (e.g., assembling, matching, and storing symbol structures). This assumption limits what current computers can do, as manifest in: the symbol grounding problem, combinatorial search, inflexibilities of a rule-bound mechanism, and inefficient real-time coordination. The most "egregious" category mistake is "the notion that the whole enterprise [of AI] can proceed by studying behavior, mental performance and competence, and language under the assumptions of functionalism without first understanding the underlying biology." (p. 15) By this account, Newell's (1990) attempts to relate psychological data to biological constraints (not cited by Edelman) are inadequate because the "bands" of Unified Theories of Cognition misconstrue the interpenetration of neural and environmental processes (Section 2). Putting "mind back into nature" requires considering "how it got there in the first place.... [We] must heed what we have learned from the theory of evolution." Edelman observes that only biological entities have intentions, and asks, what kind of morphology provides a minimum basis for mental processes, and "when did it emerge in evolutionary time"? (p. 33) How did the brain arise by natural selection? By better understanding the development of hominid behavior in groups and the development of language, we can better characterize the function and development of mental processes, and hence understand how morphology was selected. Given the 99% genetic similarity between humans and chimpanzees, we would do well to understand the nature, function, and evolution of the differences. Edelman seeks to uncover the distinct physical capabilities that separate animals from other life and humans from other primates. What hardware organizations make language and consciousness possible? 1. Formation of primary connections between cells may continue in the development of the immature organism, intermixed with formation of secondary repertoires (neuronal groups). The nature of synaptic and neuronal group selection changes after adolescence, affecting acquisition of new languages in adults (explaining Rosenfield�s analysis of language evolution over multiple generations). 3) The system exhibits a form of memory at the cellular level (prior to antibody reproduction). The theory explains "how multiple maps lead to integrated responses, and how they lead to generalizations of perceptual responses, even in the absence of language." (p. 82, emphasis added). Edelman's theory of neuronal group selection (TNGS) has several components: 1) How the structure of the brain develops in the embryo and during early life (topobiology); 2) a theory of recognition and memory rooted in "population thinking" (Darwinism); and 3) a detailed model of classification and neural map selection (Neural Darwinism). Topobiology "refers to the fact that many of the transactions between one cell and another leading to shape are place dependent."(p. 57) This theory partially accounts for the nature and evolution of three-dimensional functional forms in the brain. Movement of cells in epigenesis is a statistical matter (p. 60), leading identical twins to have different brain structures. Special signaling processes account for formation of sensory maps during infancy (and in some respects through adolescence). The intricacy of timing and placement of forms helps explain how great functional variation can occur; this diversity is "one of the most important features of morphology that gives rise to mind." (p. 64) Diversity is important because it lays the foundation for recognition and coordination based exclusively on selection within a population of (sometimes redundant) connections. --reentry, which links two maps bi-directionally through "parallel selection and correlation of the maps'neuronal groups" (p. 84). The levels of nested components involved in categorization are: neural cells, neuronal groups, neural maps, classification couples, and global maps. I summarize these components in the following two subsections. 2. Here Edelman follows von Foerster�s (1980) usage, suggesting that the term "information" be reserved for categories constructed by an organism in segmenting and classifying signals. Maturana goes a step further, insisting that in labeling phenomena as "signals" an observer is partitioning a single interactive process into "inside" and "outside" components and events. This is an important aspect of scientific study, but should not suggest that the analytic categories have existence apart from the observer�s ontology and purposes (for discussion, see Winograd and Flores (1986) and Dell (1985)). Neuronal groups are collections of neural cells that fire and oscillate together (p. 95). Neuronal groups are the units of selection in the development of new functioning circuits (p. 85-86). By analogy to organisms in a species and lymphocytes, neuronal groups are individuals (Table 1). Reactivation of a neuronal group corresponds to selection of individuals in a species3. Although one might suppose individual synapses or neurons to correspond to individuals in a population, individual neurons are in general always selected within a group and only influence other neurons through groups: Each neural cell "receives inputs from cells in its own group, from cells in other groups, and from extrinsic sources." (p. 88)4 The existence of neuronal groups is controversial, but has been experimentally demonstrated (pp. 94-95). Edelman doesn't relate neuronal selection as clearly to species evolution as we might expect for a popularized treatment. I attempt here and in Table 2 to make the connections more explicit. First, a significant number of non-identical neuronal groups can function similarly within maps (responding to the same inputs), a fundamental property of TNGS called degeneracy (Edelman, 1987, p. 6). This roughly corresponds to different individuals in a species having different genotypes, but selected within an environment for similar functional characteristics. Apparently, a population of neuronal groups becomes a "species" when it becomes functionally distinct from other populations. This occurs when maps interact during the organism's behavior. In effect, the "environment" for a map consists of other active maps. Excitatory and inhibitory interactions between maps correspond to inter-species interactions at the level of competitive and symbiotic relations in the environment. Neural maps effectively define each other's populations by activation relations between their neuronal groups. Reentry (bi-directional activation between populations of neuronal groups) provides the means for map interaction and reactivation during organism behavior. Reentry explains how "brain areas that emerge in evolution coordinate with each other to yield new functions" (p. 85) during an individual organism's lifetime. Specifically, local maps can be reused without copying by selection of additional reentry links to form new classification couples (with specialized interactions between their neuronal groups). Edelman concludes that reentry thus provides "the main basis for a bridge between physiology and psychology" (p. 85). Functionally segregated map, responding to local features & participating in classification couples with other maps. 3. Note that the ideas of "mating" and "reproduction" are not essential parts of the more general ideas of population thinking and recognition. Apparently, the reactivation of a neuronal group corresponds to reproduction of a new individual with "inherited" relations from its activation within previous maps. Changes in genotype of individuals in a species correspond to changes in strength of synaptic connections of neuronal groups within a map (p. 94). A simple evolutionary analogy might suggest viewing an individual as an instance of a species. Instead, we view a species as a coherent collection of interacting individuals (here a map of neuronal groups). Thus, the connections define the population. Furthermore, selection occurs on multiple levels of form�neuronal groups, maps, and maps of maps. 4. Formation of synaptic connections (primary repertoire) and neuronal groups (secondary repertoire) can be intermixed (p. 85). The extraordinary, three-fold increase in human brain size after birth (Leakey, 1992, p. 159) may be related to the formation of reentrant loops between the conceptual cortex and perceptual categorization, enabling primary consciousness (Figure 1). 5. See Reeke, et al. (1990) for further comparison of reentry to recursion. Categorization is therefore relational, occurring within, and in some sense bound to, an active, ongoing coordinated sequence of sensory and motor behavior: "The physical movements of an animal drive its perceptual categorization�" (p. 167). Crucially, global maps themselves rearrange, collapse, or are replaced through perturbations at different levels (p. 91). In effect, Edelman claims that a special kind of physical link between conceptual and perceptual categorization enables being tacitly aware of ourselves in relation to what we have done before or imagined will occur. This self-reference, the dynamic coordination of action and attention described by Rosenfield, involves conceptualization of internal experience in a manner that is "direct," rather than mediated by deliberation. Nevertheless, linguistic naming and inference in our previous activity over time plays a key role in self conceptualization. For example, according to this theory, comprehending a set of instructions involves conceptualization that enables oriented action in the future, without consulting the instructions. Of course, linguistic representation (naming, telling stories, giving explanations) is essential for dealing with an inability to coordinate activity by primary consciousness alone ("impasses" described by Bartlett (1932) and "breakdowns" described by Winograd and Flores (1986)). For example, in following through a previously comprehended plan, we may become aware that we don't know what to do next because we sense that a situation is unfamiliar. Paralleling Dennett's (1992a) analysis, Edelman suggests that reports of subjective experience can be correlated and used as a basis for the scientific study of consciousness. --"continual reentrant signaling between the value-category memory and the ongoing global mappings that are concerned with perceptual categorization in real time." If only the organism could hit upon a way of turning round upon its own 'schemata'and making them the objects of its reactions... It would be the case that the organism would say, if it were able to express itself: "This and this and this must have occurred, in order that my present state should be what it is". And, in fact, I believe this is precisely and accurately just what does happen in by far the greatest number of instances of remembering... (Bartlett, 1932, p. 202). Higher-order consciousness involves language for modeling the relation of the self to the world and interactions with other members of the species. But "a model of self-nonself interaction probably had to emerge prior to a true speech," as is indicated by chimpanzee behavior. (p. 126) By such conceptualization, an animal can experience higher-order consciousness without language, but not represent what it means or employ it to reason about problems. Language involves naming, telling stories about the past, constructing causal theories, modeling designs for new artifacts, and comparing plans for future actions. In humans, "consciousness of being conscious" involves linguistically representing "a true self (or social self) acting on an environment and vice versa." (p. 131)6 Individuals with impaired linguistic ability may have a self concept that is historically and socially distorted from the perspective of other members of the group (cf. the case of Monsieur A). (awareness of intention; basic self reference). Awareness of having previous experiences, imagining experiences; conceptualization of self, others, world (awareness of self reference). "Neurological disease" refers to disruptions of sight, movement, and so forth, and is the result of alterations in the regions of the brain involved in these functions. "Psychiatric disease" refers to alterations in categorization, mental activity, qualia, and so forth, in which responses are symbolically deviant or in which "reality testing" is compromised. (p. 181). 6. Edelman presents only abstract descriptions of "discriminating qualia," "delaying responses," and "inner events that are recalled." A psychologist or anthropologist would have given at least one example. Is higher-order consciousness necessary to buy groceries? To stalk game? To plant a crop? The evolutionary interactions of language, culture, and consciousness remain obscure. What happens when we comprehend a written plan? Diagnose a patient? Edelman hasn�t even begun to relate his model of the brain to existing models of reading, problem solving, and understanding. 7. Recalling Rosenfield�s remark that Edelman should emphasize relations instead of categories, we might remain alert to misleading aspects of such diagrams. In particular, "correlation" occurs as areas of the brain configure each other; particular kinds of categories or memories are not located in particular boxes. If we treat boxes uniformly as structural areas of the brain and the lines as reentrant activation links, then classification occurs as a coupled reconfiguration of maps (composed of neuronal groups) within two or more boxes. That is, categorizing physically exists only as a process of co-configuring multiple areas, not as stuff stored in some place. Thanks to Reeke et al. (1990), Edelman's theories are being tested by development of computer models. Edelman strongly supports the constructive approach of AI: "the only way we may be able to integrate our knowledge of the brain effectively, given all its levels, is by synthesizing artifacts." (p. 188) He proposes the term "noetics" for devices that "act on their environment by selectional means and by categorization on value," (p. 192) in contrast with devices that adapt only within fixed, predesigned constraints (cybernetics) or programmed devices (robotics). Darwin III8 is a "recognition automata that performs as a global mapping" (p. 92) that coordinates vision with a simulated tactile arm in a simulated environment. It is capable of "correlating a scene" by reentry between value-category memory and perceptual categorizations. Values are built in (e.g., light is better than darkness), but the resulting categorizations are all internally developed. The system consists of 50 maps, containing 50,000 cells and over 620,000 synaptic junctions (Reeke, et al., 1990, p. 608). This system rests on the model of "reentrant cortical integration" (RCI) which has been tested with much larger networks (129 maps, 220,000 cells, and 8.5 million connections) that simulate visual illusions and the detection of structure from motion in the monkey's visual cortex. --details concerning global mapping, reentrancy, sensorimotor maps, generalization, classification couples. We can also apply Pagels'criteria (1988, p. 140-141) for comparing connectionists'models. First, like connectionist models, Darwin III is not neurally realistic and arguably lacks massive parallelism. But unlike most connectionist models, Darwin III is not constructed by building in words referring to concepts and things in the world that it will learn about (Reeke and Edelman, 1988). Finally, Darwin III is based on a series of principles involving evolution, selectionism, development, non-encoding nature of representations, and a distinction between concepts and symbols. 8. This program shouldn�t be confused with Calvin�s "Darwin Machine" (Calvin, 1990; p. 372), which was proposed five years after the initial work by Reeke and Edelman. Edelman's and Rosenfield's discussions of non-linguistic coordinations provide a way of understanding the claim that knowledge doesn't consist of stored representations and linguistic programs. Even if the reader doesn't buy their argument that there are no stored linguistic structures, the discussion of coordination reveals the adaptability they believe that programs lack. [There is no] dictionary of all the words I know stored in my brain, waiting for me to use them. I create my language, and my sense of myself, more dynamically, just as I move around bodily in space. My sense of "posture" is not stored in my brain, but, rather, the ability to create one posture from another is, the ability to establish relations. And the senses of self and speech, like posture, are constantly evolving structures; what I just said determines, in part, what I will say. Just as one posture gives rise to another and one sentence gives rise to another, one expression of my personality gives rise to another. To understand this non-symbolic notion of a schema, consider the movement of limbs in space. The places and orientations of our limbs, eyes, fingers are infinite. Yet, we can symbolically model these relations. We can define points and parameterize space as a coordinate system, thus categorizing the locations of sensory surfaces. By doing this, we can effectively describe human motions, mimic motions in animated simulations, and effectively control robotic behavior. We do all this linguistically, in terms of objects, places, and angles we have defined in our modeling endeavor. The resulting parameterization has some degree of precision determined by the categories and scales we have chosen. The possible space of descriptions, learned behaviors, and control will be bound by the grain size of these representational primitives. For a stable environment with specified goals, a given model may fit satisfactorily. But more refined coordination descriptions will require finer distinctions--changing the representational language. As engineers, we can iterate in this way until we reach a satisfactory model for the purposes at hand. Now, the claim implicit in Edelman's and Rosenfield's argument about biological function (and indeed, implied by Dewey (1896)) is that the human sensorimotor system achieves increasing precision in real-time, as part of its activity. Learning to be more precise occurs internally, within an active coordination. Animal behavior clearly shows that such adaptations don't require language. Indeed, there is a higher-order of learning in people, involving a sequence of behaviors, in which we represent the world, reflect on the history of what we have done, and plan future actions. In this case, exemplified by the engineer redesigning the robot, the representational language develops in conscious behavior, over time, in cycles of perceiving and acting. Newell and Simon (1972, p. 7) called this kind of learning a "second-order effect." Rosenfield and Edelman insist that learning is also primary and is at this level not limited by linguistic representational primitives. Certainly, a scientist looking inside will see that adaptations are bound by the repertoire of neural maps available for selection and the history of prior activations. But first, the learning does not require reasoning about programs, either before or after activity. The bounding is in terms of prior coordinations, not descriptions of those coordinations, either in terms of the agent's body parts or places in the world. The claim is that this direct recomposition of prior sensorimotor coordinations, in the form of selection of maps and maps of maps, provides a "runtime" flexibility that executing linguistic circumscriptions of the world does not allow. Indeed, reflection on prior behavior, learning from failures, and representing the world provide another kind of flexibility that this primary, non-linguistic learning does not allow. Chimps are still in trees; men walk on the moon. But understanding the role of linguistic models requires understanding what can be done without them. Indeed, understanding how models are created and used--how they reorient non-linguistic neurological components (how speaking changes what I will do)--requires acknowledging the existence and nature of this nonlinguistic mechanism that drives animal behavior and still operates inside the human. For example, it is obvious that the dynamic restructuring of posture and speech at a certain grain size bear, for certain kinds of knowledgeable performances, a strong isomorphic mapping to linguistic descriptions, as for example piano playing is directed by a musical score. But in the details, we will find non-linguistically controlled improvisation, bound not by our prior descriptions, but by our prior coordinations. For example, the piano player must sometimes play an error through again slowly to discover what finger is going awry, thus representing the behavior and using this description as a means of controlling future coordinations. How that talk influences new neurological compositions, at a level of neural map selection that was not consciously influenced before, becomes a central issue of neuropsychology. The machine learning idea of "compiled knowledge" suggests that subconscious processes are merely the execution of previously conscious steps, now compiled into automatic coordinations. Edelman and Rosenfield emphasize that such models ignore the novel, improvised aspect of every behavior. Certainly the model of knowledge compilation has value as an abstract simplification. But it ignores the dynamic mechanism by which sensorimotor systems are structured at runtime with fine relational adjustments that exceed our prior verbal parameterizations. And for animals, such models of learning fail to explain how an animal learns to run through a forest and recognize prey without language at all. In learning to ski, for example, there is a complex interplay of comprehending an instructor's suggestions, automatically recomposing previous coordinations, and recomposing (recalling) previous ways of describing what is happening. Behavior is coordinated on multiple levels, both linguistic and nonlinguistic, with prior ways of talking, imagined future actions, and attention to new details guiding automatic processes. The important claim is that representing what is happening, as talk to ourselves and others, occurs in our conscious behavior, that it is a manifestation of consciousness, and that it must necessarily be conscious in order to have deliberate, goal-directed effect. Dewey and Ryle's claim that deliberation occurs in our behavior, and not in a hidden way inside, is another way of framing Edelman and Rosenfield's claim that we must understand the structure of consciousness, the progressive flow of making sense of experience, if we wish to understand human cognition. 9. Arbib�s work (which isn�t cited by Edelman) forms a bridge between neurological models like Neural Darwinism and cognitive theories of vision, planning, and learning. Arbib does an especially good job of reconciling the points of view, where Edelman tends to be dismissive. 10. History does not record whether Head�s "happening," so far in advance of the 1960s American theatrical form by the same name, bears any relation to the "be-in" experienced by Heidegger. Edelman may go astray in viewing some disciplines outside his own in a stereotyped, monolithic way. Although he would never say "biology believes" or "physics believes" he presents AI and cognitive science as if they were points of view or dogmas, rather than disciplines of study. This error, pointed out by Sloman (1992), treats a theory as if it were a field, dismissing the field instead of competing theories within it--a category error. Edelman's position is ironic, given his belief that constructing artificial intelligence systems is possibly the only way to integrate our knowledge of how the brain works. Edelman's narrow conception of computer science is manifested in his use of the terms "software," "instruction," "computation," "information," "machine," and "computer" itself. For example, he says that it is not meaningful to describe his simulations of artifacts "as a whole as a computer (or Turing machine)." (p. 191) Thus, he identifies "computer" with "prespecified effective procedure." This is silly, given that his own system, NOMAD, is built from an N-cube supercomputer. The useful distinctions are the differing architectures, not whether a computer is involved. It is a category error to identify a particular software-hardware architecture as "acting like a computer." Here Edelman speaks like a layperson, as if "the computer" is a theory of cognition. Unfortunately, this misunderstanding leads Edelman to reject all functional approaches to cognitive modeling. He believes that functionalism characterizes psychological processes in terms of software algorithms, implying that the hardware ("the tissue organization and composition of the brain", p. 220) is irrelevant. From this perspective, functionalism involves promoting a particular kind of hardware architecture, namely that of today's computers, as well as a particular kind of computational model, namely algorithms. This view, sometimes called mentalism, is also attacked by Lakoff, the later Putnam (1988), Bruner (1990), Searle, and many others whom Edelman cites. Some computer scientists find it hard to believe that anybody ever believed in Functionalism, even though it was the everyday working hypothesis that drove the invention of expert systems and cognitive modeling in the 1970s (see (Clancey, 1992) for an extended discussion with other quotes from the AI literature). On the other hand, it is obvious that Edelman accepts the weaker idea of functional descriptions, for he bases his distinction between perceptual, conceptual, and symbolic categorization on Lakoff's analysis of linguistic expressions (1987). Furthermore, Edelman explicitly acknowledges that in focusing on biology, he does not mean that artifacts must be made of organic molecules. When he says that "the close imitation of uniquely biological structures will be required," (p. 195) he means that developing artificial intelligence requires understanding the properties of mechanisms that today only exist on earth as biological structures. In this respect, Edelman is just as much a functionalist as Dennett. What he means to say is that certain capabilities may be practically impossible on particular hardware. For example, Pagels (1988) argues that it is practically impossible to simulate the brain using a Turing machine, even if it could be so described in principle. AI is a kind of engineering, an effort of practical construction, not of mathematical possibility. Without functional abstractions to guide us, we'd be limited to bottom-up assembling of components to see what develops. Models of "universal grammar" exemplify how functionalist theories can be reformulated within the biological domain. Arguing against Chomsky's analysis, Edelman claims that Neural Darwinism doesn't postulate "innate genetically specified rules for a universal grammar." (p. 131) But he doesn't consider the possibility that universal grammar may usefully describe (and simplify) the transformations that occur as conceptual and symbolic recategorizations. Functional descriptions, as expressed in today's cognitive models, can provide heuristic guidance for interpreting and exploring brain biology. Contrasting with Edelman's critique, Pagels (1988) offers a more accessible analysis of the limitations of cognitive science. Pagels states that "the result of thirty years'work�[is] brilliantly correct in part, but overall a failure�. The study of actual brains and actual computers interacting with the world�is the future of cognitive science." (p. 190-191) Pagels helps us realize the irony that the quest for a physical symbol system so often assumed that the material processes of interaction with the world are inconsequential (the Functionalist stance). Thus, mind is disembodied and a timeless, ungrounded mentalism remains. According to the Physical Symbol System Hypothesis, the material processes of cognition are the data structures, memories, comparators, and read-write operations by which symbols are stored and manipulated. At its heart, Edelman's appeal to biology is a claim that other kinds of structures need to be created and recombined, upon which sensorimotor coordination, conceptualization, language, and consciousness will be based. This idea is certainly not new. Dewey (1938) argued for biologically-based theories of mind (by which he meant a functional analysis of life experience, akin to Rosenfield's level of description). Dewey also anticipated problems with exclusively linguistic models of the mind (Dewey and Bentley, 1949). In conclusion, we might forgive Edelman's "bashing," in view of the fragmentation of views and varying formality of AI research. Edelman can hardly be criticized for adopting the most obvious meanings of the terms prevalent in the literature. In participating in our debate, we can't fault Edelman if he becomes bewildered when we respond, "Not that kind of computer (but one we have yet to invent)" or "Not that kind of memory (but rather one more like what a connectionist hopes to build)." We somehow expect newcomers to be not too critical of what's already on the table, and to sign up instead to the dream. Despite the different levels of analysis, Rosenfield's and Edelman's books are highly consistent and complementary. Both underscore that perceiving is a form of restructuring previous neural activations, as opposed to matching stored linguistic representations. Both emphasize that developmental stages are grounded in body experience. Both view consciousness as a primary human experience that requires explanation if we are to understand memory and reasoning (but neither cites Dennett). Both believe that theories of cognition must be based on biological arguments about development (but neither cites Dewey or Maturana). Differences lie in the level of discussion: Rosenfield focuses on the nature of consciousness, revealed by clinical data; Edelman provides a broad framework for constructing artificial intelligence, inspired by detailed models of neurological processes. Rosenfield extends the perimeter and depth of a theory of mind; Edelman fills it in. When studied in detail, Rosenfield's and Edelman's books provide a wealth of new starting points for AI. For example, recently there has been more interest in modeling emotions in AI. These books suggest moving beyond static taxonomies (which are useful early in a scientific effort) to viewing emotions as dynamic, functional, relational experiences. Could the phenomenology of emotional experience be modeled as integral steps in sense-making, as Bartlett's model of reminding suggests? The oddity of Rosenfield's patients, coupled with an evolving architectural model of the brain, often brings to mind questions for further investigation. For example, how did Mr. Baud's inability to remember experience past twenty seconds impair learning new skills or concepts? Cognitive scientists today could easily suggest interesting problems to give Mr. Baud. Similarly, could Gelb and Goldstein's patient, who couldn't understand proverbs or comparisons, make up a story at all? Did she understand causal explanations? Could she describe and rationalize her own behavior? As Rosenfield's book suggests, cognitive neuropsychology is changing. It is time to seek synergy between our disparate models and evidence. As some reviewers of Newell's Unified Theory of Cognition suggest, this also entails reconceptualizing what models like Soar describe in relation to the brain (Arbib, in press; Pollack, in press). 6.1 Why isn't all reasoning subconscious? As an example of how cognitive models might be reconceived, consider why a problem solver is aware of intermediate reasoning steps. Nothing in the stored-schema view requires that inference is consciously monitored. In Soar, for example, "working memory," where intermediate results come together, corresponds to an agent's awareness, but nothing in the model explains why reasoning is experienced as "phenomenally subjective" (Newell, 1990, p. 434). Indeed, why isn't all verbal inference subconscious? When we ask a problem solver to think out loud, are we just, like our subject, witnessing ideas spilling over from their more usual, hidden source, like water splashing over a glass? Could verbal thoughts otherwise occur without anyone knowing? Rosenfield's analysis provides a partial explanation: Representing and inquiry go on in activity, that is, in cycles of perceiving and expressing (talking, gesturing, writing) over time. By conjecture, sense-making is necessarily conscious because it involves action and comprehension of what our acts mean occurring together. For example, speaking is not just outputting prefabricated linguistic expressions, but a dual process of creating representations in action and comprehending what we are saying. We are "making sense" as we speak--perceiving appropriateness, adjusting, and restating in our activity itself. The process is "dual" because perception, awareness of what we are doing, is integral to every statement. Conscious awareness is not just passive watching, but an active process of sustaining a certain kind of attention that changes the results of inquiry. This analysis suggests specifically that we reconsider "remindings" and other commentary of the subject in experimental problem solving protocols as revealing the perceptual work of creating and using representations. Following Edelman, the rest of the matter, what is going on behind the scenes, is non-linguistic coordination. Conscious acts of fitting--dealing with breakdowns (Winograd and Flores, 1986)--occur precisely because there is no other place for linguistic representations to be expressed and reflected on, but in our experience itself. This is why we write things down or "talk through" an experience to clarify meanings and implications for future action. Protracted, conscious experience--as in writing a paragraph--is not merely an awareness of elements placed in "working memory," but an active process of recoordinating and recomprehending (reperceiving) what we are doing. In the words of Bartlett, "turning around on our own schemata" is possible precisely because we can re-coordinate non-linguistic schemata in our activity of representing. According to Edelman, the articulation process of "building a scene" is reflective at a higher-order because of reentrant links between Broca and Wernicke's areas and perceptual categorization (the "semantic bootstrap" of Figure 1): Our perceptual sense of similarity (reminding) and articulation (naming, history-telling, theorizing) are bound together, so symbolizing actions are driving subsequent perceptions. A sequence of such activity is coordinated by composing a story that accumulates observations and conceptual categories into a coherent sense of what we are trying to do (the scene). In other words, being able to create a story (e.g., the sense-making of a medical diagnostician) is precisely what higher-order consciousness allows. Crucially, human stories are not merely instantiated and assembled from grammars, but are coupled to non-linguistic coordinations grounded in perceptual and motor experience (Lakoff, 1987). Hence, consciously-created stories can have an aspect of improvisation and novelty that stored linguistic schema mechanisms do not allow. This analysis provides an alternative, biologically-grounded perspective on recent arguments about planning and situated action (Suchman, 1987; Agre, 1988). The key idea is that perceiving and acting co-determine each other through reentrant links. Representing occurs in activity, as a means of stepping outside the otherwise automatic process by which neural maps (schemata) are reactivated, composed, and sequenced. Goal-directed, attentive behavior of primary consciousness involves holding active a higher-order organization (global maps) and coordinating the relation to ongoing perceptions (i.e., directed attention). In higher-order consciousness, these global maps are coupled to linguistic descriptions of objects, events, goals, and causal stories. Robot designers may be impatient with the vagueness of such descriptive theorizing. But it is clear that the clinical evidence and neurobiological mechanisms of Rosenfield and Edelman are adequate to promote further reconsideration of our models of explanation, remembering, and story-telling, including the seminal work of Bartlett. These two books suggest that subfields within cognitive science are changing and then coming together in new ways. New understanding of neural development and anatomy suggests radical reinterpretation of classic cases of psychological dysfunction. Cognitive neuropsychology is moving away from the stored linguistic schema model of memory. Selectionist models of learning suggest that functional processes can be constructed "in-line," without mediating linguistic descriptions of what the processes do or how the parts fit together. Studies of language and human learning place new primacy on the representations that people see, hear, and manipulate interactively, relegating internal subconscious structures and processes to another level of operation. Interest in modeling animal behavior leads us to reexamine the capabilities of agents without language, and the evolution of consciousness within a social system. It is tempting to predict that the development of global map architectures, as in Darwin III, will become a dominant approach for neural network research, effectively building on situated cognition critiques of the symbolic approach (Clancey, in press). However, if it becomes essential to understand the chaotic processes of the brain, as Freeman(1991), Pollack (in press), and others argue, it is less clear how the researchers who brought us Pengi and Soar will participate in building the next generation of AI machines. All told, there are probably more pieces here than most researchers can follow or integrate in their work. A good bet is that progress in AI will now depend on more multidisciplinary teams and efforts to bridge these diverse fields. Rosenfield and Edelman make a big leap forwards, showing consciousness to be an evolved activity, grounded in and sustaining an individual's participation in the world as a physical and social personality. With theories like self-reference, population thinking and selectionism, we pick up Bateson's challenge in Mind and Nature: A necessary unity, finding the patterns that connect the human world to nature and all of the sciences to each other. The book review editors, Mark Stefik and Steve Smoliar, provided, as usual, a great number of insightful suggestions for clarification and elaboration of my remarks. Funding has been provided in part by a gift from the Xerox Foundation and the National Science Foundation. Agre, P. 1988. The Dynamic Structure of Everyday Life. MIT PhD Dissertation. Arbib, M.A. 1992. Schema theory. In S. Shapiro (editor), The Encyclopedia of Artificial Intelligence, New York: John Wiley & Sons. Arbib, M.A. (in press). Review of Newell's Unified Theories of Cognition. To appear in Artificial Intelligence. Bamberger, J. 1991. The mind behind the musical ear. Cambridge, MA: Harvard University Press. Bartlett, F. C.  1977. Remembering­-A Study in Experimental and Social Psychology. Cambridge: Cambridge University Press. Reprint. Bateson, G.1979. Mind and Nature: A necessary unity. New York: Bantam. Berger P.L and Luckmann, T. 1967. The Social Construction of Reality: A Treatise in the Sociology of Knowledge. Garden City, NY: Anchor Books. Bruner, J. 1990. Acts of Meaning. Cambridge: Harvard University Press. Calvin, W.H. 1990. The Cerebral Symphony: Seashore Reflections on the Structure of Consciousness. New York: Bantam Books. Calvin, W. H. 1991. Islands in the mind: dynamic subdivisions of association cortex and the emergence of the Darwin Machine. The Neurosciences, 3, pp. 423-433. Clancey, W.J. 1991. Review of Israel Rosenfield's The Invention of Memory. Artificial Intelligence, 50(2), 241-284. Clancey, W.J. 1992. Representations of knowing: In defense of cognitive apprenticeship. Journal of Artificial Intelligence in Education, 3(2),139-168. Clancey, W.J. (in press). Situated action: A neuropsychological interpretation: Response to Vera and Simon. To appear in Cognitive Science. Dell, P.F. 1985. Understanding Bateson and Maturana: Toward a biological foundation for the social sciences. Journal of Marital and Family Therapy, 11(1), 1-20. Dennett, D.C. 1992a. Consciousness Explained. Boston: Little, Brown and Company. Dennett, D.C. 1992b. Revolution on the Mind: Reviews of The Embodied Mind and Bright Air, Brilliant Fire. New Scientist, June 13, pp. 48-49. Dewey, J. 1981. The reflex arc concept in psychology. Psychological Review, III:357-70, July. Reprinted in J.J. McDermott (editor), The Philosophy of John Dewey, Chicago: University of Chicago Press, pp. 136-148. Dewey, J. 1981. The Child and the Curriculum. Chicago: University of Chicago Press. Reprinted in J.J. McDermott (editor), The Philosophy of John Dewey, Chicago: University of Chicago Press, pp. 511-523. Dewey, J. 1938. Logic: The Theory of Inquiry. New York: Henry Holt & Company. Dewey, J. and Bentley, A.F. 1949. Knowing and the Known. Boston: The Beacon Press. Edelman, G.M. 1987. Neural Darwinism: The Theory of Neuronal Group Selection. New York: Basic Books. Freeman, W. J. 1991. The Physiology of Perception. Scientific American, (February), 78-85. Gallwey, W.T. 1974. The Inner Game of Tennis. New York: Bantam Books. Gould, S. J. 1987. Nurturing Nature, in An Urchin in the Storm: Essays about Books and Ideas. New York: W.W. Norton and Company. pp. 145-154. Greenwald, A.G. 1981. Self and memory. In G.H. Bower (editor), The Psychology of Learning and Motivation Volume 15. New York: Academic Press. pp. 201-236. Hofstadter, D.R. 1979. Gödel, Escher, Bach: an Eternal Golden Braid. New York: Basic Books. Johnson-Laird, P.N. 1983. Mental Models: Towards a Cognitive Science of Language, Inference, and Consciousness. Cambridge, MA: Harvard University Press. Leakey, R. and Lewin, R. 1992. Origins Reconsidered: In Search of What Makes Us Human. New York: Doubleday. Luria, A.R. 1968. The Mind of a Mnemonist. Cambridge, MA: Harvard University Press. Newell, A. 1990. Unified Theories of Cognition. Cambridge, MA: Harvard University Press. Newell, A. and Simon, H. 1972. Human Problem Solving. Englewood Cliffs, NJ: Prentice Hall. Ornstein, R. E. 1972. The Psychology of Consciousness. New York: Penguin Books. Pagels, H.R. 1988. The Dreams of Reason: The Computer and the Rise of the Sciences of Complexity. New York: Bantam Books. Pollack, J.B. (in press). Review of Newell's Unified Theories of Cognition. To appear in Artificial Intelligence. Putnam, H. 1975. Philosophy and our mental life, in Philosophical Papers 2: Mind, Language and Reality. New York: Cambridge University Press. pp. 291-303. Putnam, H. 1988. Representation and Reality. Cambridge: The MIT Press. Reeke, G.N. and Edelman, G.M. 1988. Real brains and artificial intelligence. Daedalus, 117 (1) Winter, "Artificial Intelligence" issue. Reeke, G.N. Finkel, L.H., Sporns, O., and Edelman, G.M. 1990. Synthetic neural modeling: A multilevel approach to the analysis of brain complexity. In G.M. Edelman, W.E.Gall, and W.M. Cowan (editors), The Neurosciences Institute Publications: Signal and Sense: Local and Global Order in Perceptual Maps (Wiley, New York) pp. 607-707 (Chapter 24). Rosenfield, I. 1988. The Invention of Memory: A New View of the Brain. New York: Basic Books. Ryle, G. 1949. The Concept of Mind. New York: Barnes & Noble, Inc.
Sacks, O. 1984. A Leg to Stand On. New York: HarperCollins Publishers. Schön, D.A. 1979. Generative metaphor: A perspective on problem-setting in social policy. In A. Ortony (Ed), Metaphor and Thought. Cambridge: Cambridge University Press. 254-283. Schön, D.A. 1990. The theory of inquiry: Dewey's legacy to education. Presented at the Annual Meeting of the American Educational Association, Boston. Sheldrake, R. 1988. The Presence of the Past: Morphic Resonance and the Habits of Nature. New York: Vintage Books. Sloman, A. 1992. The emperor's real mind: Review of Roger Penrose's The Emperor's New Mind: Concerning Computers, Minds, and the Laws of Physics. Artificial Intelligence, 56 (2-3), 355-396. Smoliar, S.W. 1989. Review of Gerald Edelman's Neural Darwinism: The Theory of Neuronal Group Selection. Artificial Intelligence 39(1), 121-136. Smoliar, S.W. 1991. Review of Gerald Edelman's The Remembered Present: A Biological Theory of Consciousness. Artificial Intelligence 52(3), 295-319. Tyler, S. 1978. The Said and the Unsaid: Mind, Meaning, and Culture. New York: Academic Press. Vera A. and Simon. H. (in press). Response to comments by Clancey on "Situated Action: A symbolic interpretation." To appear in Cognitive Science. von Foerster, H. 1980. Epistemology of communication. In K. Woodward (editor), The Myths of Information: Technology and Postindustrial Culture. Madison, WI: Coda Press. Winograd, T. and Flores, F. 1986. Understanding Computers and Cognition: A New Foundation for Design. Norwood: Ablex.